Porter’s Industrial and KSLA News 12 have partnered with Volunteers for Youth Justice to Get Kids Back In School. The Volunteers for Youth Justice worked with over 7,000 families in our area last year and at least 4,200 were truant. Many acknowledged that their truancy was due to not having the appropriate uniform. With your help, we want to provide the uniforms so that the Volunteers for Youth Justice can maintain a year-round uniform closet to serve the needs of the children in their programs. 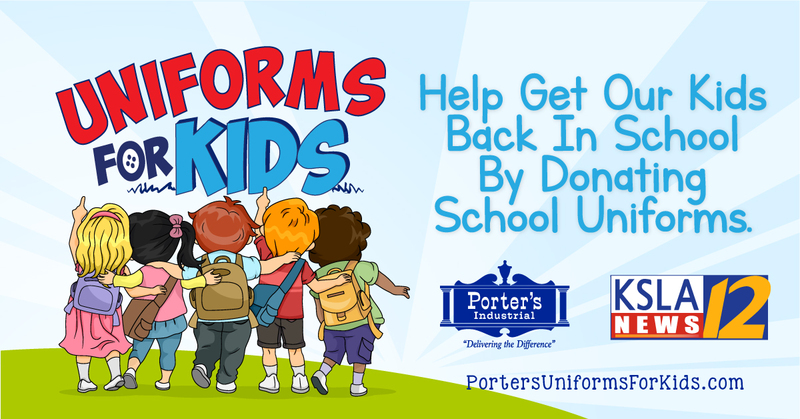 Please drop off your gently worn or new uniforms to any Porter’s location or at KSLA. Donations can also be made to purchase new uniforms by clicking on the link below through our Gofund Me Campaign. We would like to thank DA James E. Stewart for putting us in contact with Volunteers for Youth Justice and bringing this issue in our community to light.